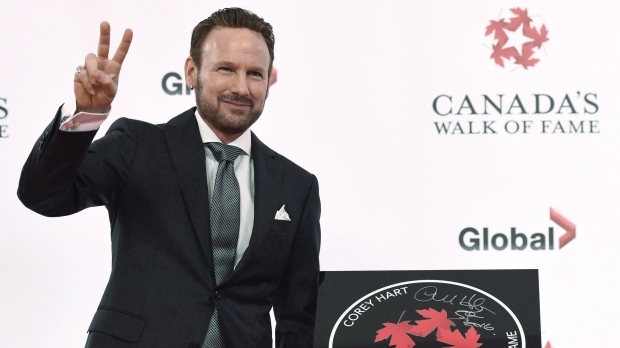 TORONTO -- Crooner Corey Hart will join Canadian music royalty in the country's music hall of fame. The Canadian Academy of Recording Arts and Sciences says the singer-songwriter has been selected as the 2019 inductee into the Canadian Music Hall of Fame. The group says Hart, who has sold over 16 million albums, will be inducted during the 2019 Juno Awards in London, Ont., on March 17, when he will also perform for the first time in 20 years. Previous winners include Anne Murray, Joni Mitchell, k.d. lang, Leonard Cohen, Neil Young, Oscar Peterson and Shania Twain. Hart became a sensation in the early '80s with his first big hit, "Sunglasses at Night," and then a follow-up album, "Boy in the Box," which sold more than one million copies in Canada alone. In a release from the academy, Hart said he was honoured to be named an inductee as he begins preparing for his first national tour in over two decades. "I am deeply humbled by this invitation into the Canadian Music Hall of Fame," said Hart. "It's an incredible honour to be acknowledged alongside so many other talented and venerable Canadian artists." The Canadian Music Hall of Fame was created in 1978 to celebrate artists who have helped increase the "international recognition of Canadian music."